The National Museum of Archaeology is presently hosting an exhibition of works from the Khalili Collections. 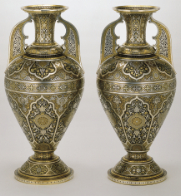 Damascene is metalwork decorated with wavy patterns of inlay or etching in gold or silver. “What is so special about this exhibition is that it displays the potential of this technique in creating little treasures of varying sizes and forms,” said Dr Debono. The exhibition displays part of the treasures assembled by Prof. Nasser Khalili, a scholar, collector and philantropist of international standing. Since 1970, under the auspices of the Khalili Family Trust, he has assembled five of the world’s finest and most comprehensive art collections, including the Spanish Damascene Metalwork, dating to the era between 1850 and 1900. Together the five collections comprise some 25,000 works. Each of the five collections is, within its field, the largest and most comprehensive in the world. The exhibition in Malta features works of art from the Spanish Damascene Metal, a collection that is unrivalled in quality and depth. The majority of the works of art were created by Placido Zuloaga, a leading artist at the time, whose creations are considered masterpieces. 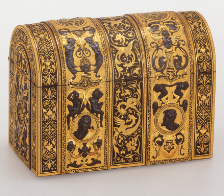 “All the artefacts on display in Malta are treasures in their own right, but if we had to single out one particular artefact, it would be the Fonthill Casket, commissioned by the British collector Alfred Morris. It is the largest item on display, a complex work involving a team of craftsmen working on this project for some two years. A remarkable masterpiece of metal,” said Dr Debono. A number of artefacts from Malta’s national collection, including a pauldron (a component of plate armour), a pistol, a Bronze Age vessel and a majolica jar are also on display complementing the exhibition. “The objects from the national collection help to explain the differences between the type of decorated wares and items we are accustomed to and items from the Khalili collection,” says Dr Debono. “They are part of an intended compare-and-contrast exercise which we propose to all our visitors at the beginning of this exhibition. They do have the same standing and importance as objects from the Khalili collection, but they are part of a different reality which is ours,” he said. Selections of the Khalili Collections have been exhibited in over 35 world class museums, including the British Museum, the Victoria and Albert Museum in London, the Alhambra Palace in Granada and the Van Gogh Museum in Amsterdam. The main sponsors of the exhibition are the Spanish embassy in Malta and Mediterranean Bank. The exhibition, open since November, runs until April 29.